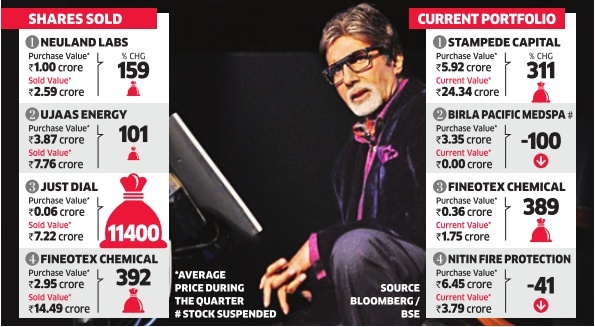 Bollywood superstar Amitabh Bachchan'S Stock Bets..! Here's one role Bollywood superstar Mr. Amitabh Bachchan is not famous for -stock picker. For instance, who's heard of Fineotex Chemical? Yet, when he sold the stock recently, he'd made a 5 fold return. On Neuland Labs, it was almost 3 times. Not bad for a Bollywood superstar. But his biggest killing seems to have been Just Dial -pre-IPO stock allotted at Rs. 10 in 2013, sold last year at Rs. 1,150 apiece. The stock is at Rs. 460 now. Rajesh Mascarenhas looks at some of Bachchan's best picks & his current portfolio -admittedly a mixed bag.